Old time Marvel favorites are back, and this time you have to help Blade take back the city. Click here to play! Stick by this superhero's side and you'll find yourself rolling in real jackpot cash. Blade is a 5-reel slot played across nine pay lines. Just by playing on this intense slot you can find yourself winning the random Marvel Jackpots. The Blade logo is scattered and can appear on any pay line; find five of them and you'll be in for 100 times your initial wager. Blade can be substituted for any other symbol in the game besides scatter, and will also win you up to 8000 times your bet. Spin up the Vampire on reels 1 and 5, and Blade on reel 3, and you will be sent to the Bonus Round where you can win plenty of cash during Re-spin madness. Join the fight against the evil vampires alongside Blade today. The Blade logo is scattered and can win anywhere up to 100 times your original stake. Blade will not only substitute for any other logo besides the scatter, he will also pay you up to 8000 times your bet. 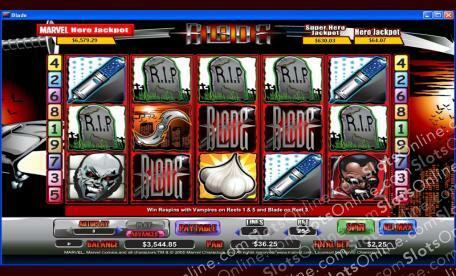 Spin the Vampire on reels 1 and 5, with Blade on reel 3, and you will be sent to the Bonus Round where plenty of cash and Re-spins await.